Learn more about replacing your teeth with dental implants by contacting us today. Implant-supported restorations are the gold standard in tooth replacement, but understanding the benefits of different types can be difficult. Our team at Astoria Dental Group can walk you through your options and find the right type of implant for you. Ready to learn more about the options available to you? Dental implants are small titanium posts surgically embedded in the jaw to replace lost tooth roots, offering the very best support for dental crowns, bridges, and dentures. Once healing is complete, Dr. Clifford Degel can restore your smile with a customized, implant-supported restoration. Mini dental implants are smaller in diameter, giving them a number of unique benefits. If a patient has waited to address missing teeth, and has experienced some jaw atrophy, mini implants can be a viable alternative. Mini implants can typically be placed and restored in a single appointment. The Prettau® implant bridge is widely recognized as the gold standard in restorative dentistry because it is made of zirconia, which offers both exceptional strength and a natural appearance. The advanced material is extremely resistant to cracks and chips, and does not stain or absorb odors. Dr. Degel uses the SIMPLANT® and Mini Drive-Lock® systems to accurately place mini dental implants in a single appointment. Using this technology he can determine the optimal position for the implants and accurately place them, setting the stage for a functional, beautiful new smile. Prettau® Anterior products will not chip, crack, or wear on your surrounding natural teeth. Zirconia is the strongest material available and has an extremely natural-looking appearance that is resistant to staining and can be color matched to your existing teeth. Zirconia dental implants offer patients who have metal allergies the opportunity to rejuvenate their smiles with the finest restorative option available. Implants made from ceramic zirconia are also made of one solid piece, eliminating prosthetic connections that can harbor bacteria. At Astoria Dental Group, we are committed to providing our patients with strong, healthy smiles that they can feel confident sharing. Dental implants are titanium posts that are surgically embedded in the jaw bone to replace lost tooth roots and provide a secure foundation for restorations. We offer several types of implants, including mini dental implants, at our Queens practice. These implants usually do not require a preparatory bone graft, and can be restored immediately following placement. You can find out if mini implants are right for you during an examination and evaluation with our highly trained implant dentist, Dr. Degel. Contact our office today to schedule your initial consultation. Curious about the benefits of mini dental implants? Mini implants can often support dentures the same day they are placed. Patients can leave our office with fully restored function and a natural-looking smile in as little as one appointment. They also offer many of the same benefits that have earned traditional dental implants recognition as a superior restorative solution. Mini implant-supported dentures will not slip out of place, and do not require messy adhesives. 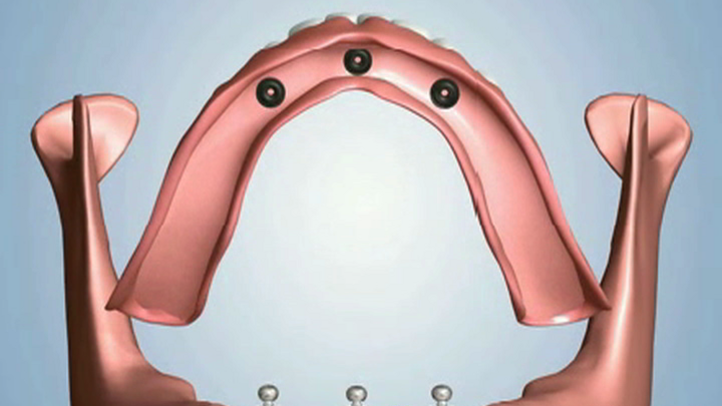 Mini implants can often be placed in jaws that have experienced some atrophy. Patients who have waited to replace missing teeth usually require a bone graft before they can receive traditional dental implants. However, thanks to their smaller diameter, mini implants require less bone mass for support. Most importantly, mini implants and traditional implants alike preserve the health of the jaw bone and can halt further atrophy. The minimally invasive technique used to place mini implants naturally reduces risks as well as recovery time. With proper care, mini dental implants can provide a lifetime of support for your dental prosthetic. Mini implants are one of the latest techniques in dentistry. Mini implants are used when there is limited bone in which to place an implant. In this clip you learn all about the many benefits of mini implants and how long the procedure takes to complete. The answer might surprise you! Similar to traditional dental implants, mini dental implants are surgically implanted into the jaw bone to replace lost tooth roots. Osseointegration is a process in which the implant becomes fused with the surrounding bone tissue, providing an extremely durable and stable support system for crowns and dentures. This process can take three to six months. However, because they have a smaller diameter than traditional implants, mini implants can support restorations before osseointegration is complete. The best way to ensure your satisfaction and the success of your procedure is to choose an experienced implant dentist. Dr. Degel has undergone specialized training in the surgical placement of implants, and is an esteemed member of the International Congress of Oral Implantologists, American Society of Osseointegration, and American College of Oral Implantology. He also uses advanced technology and the highest quality restorations, like the Prettau® Implant Bridge, to restore our patients' oral health. When tooth loss affects our patients, we often recommend dental implants to restore form and function to their smiles. A dental implant is a titanium post that is placed in the jaw to replace a natural tooth's root. Once the bone has healed, the implant can support a restoration. There are different types of titanium posts available, but nothing provides the amount of support, stability, and strength that a traditional dental implant placed at our Queens dental practice can. Dr. Degel is one of the most sought after implant dentists in all of New York. He has great success rates and consistently achieves optimal outcomes for his restorative dentistry patients. If you have missing teeth and would like to learn more about whether traditional implants are right for you, please contact our office to schedule a consultation with Dr. Degel. Want to learn more about the benefits of traditional implants? Traditional titanium posts that are allowed adequate time to fully integrate into the jawbone offer the optimal structure to support crowns, bridges, and dentures. Traditional dental implants can support any number of missing teeth and any type of restoration with predictably successful outcomes. Immediate-loading implants employ the use of mini dental implants that are attached to your restorations in one visit. Again, for appropriate candidates this can be an effective procedure, but it does not offer the same strength and durability of the larger, traditional titanium posts that have had months to fully integrate with the jaw. This process, called osseointegration, allows the implant ample time to fuse with the jawbone, essentially becoming part of the jaw's structure. Your traditional dental implant treatment plan will consist of a minimum of three visits to our office. During your fist appointment, Dr. Degel will surgically place the titanium post, followed by approximately four to six months of recovery time to allow the bone to fuse. When the healing process is complete, Dr. Degel will place an abutment piece and a temporary restoration. Once the gums have healed, he will place your permanent, customized restoration that will blend seamlessly into your smile. Our in-house dental laboratory creates beautiful crowns, bridges, and dentures using the finest materials. We proudly offer products like Prettau® Anterior that mimic the light-reflecting and translucency properties of your natural teeth. At Astoria Dental Group, we offer all types of procedures to restore your oral health. We can perform bone grafting to build up enough healthy tissue to support a dental implant and clear away any traces of periodontal disease to prepare your mouth for your surgery. We can even restore failed implants that were placed by another doctor. If you suffer from missing teeth, dental implants offer the very best option for restoring your smile. Traditional dental implants are titanium posts that are embedded in the jawbone and provide support to a crown, bridge, or denture. This replaces the entire structure of the tooth, from root to crown. While implants made from titanium are considered safe and biocompatible, some patients with allergies or sensitivities, or those who simply do not want to put metal in their bodies, are interested in an alternative. That is why we are proud to offer zirconia dental implants at our Queens dental practice. If you are missing teeth and would like to learn more about ceramic zirconia implants, please contact our office to schedule an appointment with Dr. Degel. Unlike traditional posts, implants made from zirconia contain no metal, meaning they are often chosen by patients who adhere to holistic health principles. Zirconia does not interfere with energy movement throughout the body and can help you enjoy peace of mind. Traditional implants are connected to an abutment which is attached to a crown, bridge, or denture. Although this connection is secure and healthy, ceramic zirconia implants' one-piece design further minimizes bacterial growth and protects your gum health. Zirconia implants are completely white in color. If a patient has thinning gums or is susceptible to gum recession, traditional titanium implants may cause the appearance of gray gums or visible metal at the margin of the restoration. Zirconia is a highly biocompatible material that is resistant to chemical corrosion. Metal can be corrosive, especially if another metal is nearby, like an amalgam filling or restoration. Additionally, fluoridated water can cause metal corrosion to be even more active. Zirconia does not conduct electricity, which naturally lessens bacterial growth and can help to promote better oral health overall. Zirconia is well known for its flexural and tensile strength and can withstand the extreme pressures associated with chewing. When tooth loss occurs, the jawbone stops receiving stimulation from the natural tooth's roots, which can lead to bone loss. A dental implant, made from zirconia or titanium, replaces the tooth's roots and supplies the jawbone with stimulation, which protects your jaw from further atrophy. *According to the Institute for Dental Implant Awareness, the Compendium of Continuing Education in Dentistry, and The International Journal of Oral & Maxillofacial Implants. We will typically recommend a single traditional or zirconia implant to ensure the longest-lasting, most durable results. We typically recommend dentures supported by mini dental implants or traditional implants. If you have bone loss in the jaw but do not want to undergo a bone graft, mini dental implants may be right for you. Zirconia dental implants, paired with Prettau Zirconia restorations, can provide the most natural-looking result possible. If you need to replace an entire arch of teeth as soon as possible, our dentists can determine whether implants-in-a-day are right for you. With so many options available, how do you know which is right for you? No matter what your needs, concerns, budget, and goals are, Dr. Degel can return function and aesthetics to your smile by recommending which tooth replacement option is right for you. Dr. Degel has been placing dental implants for patients at Astoria Dental Group since 1990 and is a member of several cosmetic and implant dentistry associations. He will evaluate your oral health, assess your bone density, and determine which types of implants will best serve your needs for many years to come. If you are ready to transform your smile with Astoria Dental Group, request a consultation online or call us at (718) 278-1123.